The ways that each of you were thinking synched up and you began trying short courses. How did that go? At that time, we had just shortened the New Super Mario Bros. U courses and increased the difficulty, but when you played them, they really were good. Even on courses we already knew, the variations on gameplay broadened, and it felt very fresh to play. But we hadn’t yet thought of making lots of downloadable content. Even though it was add-on content? Yes. I thought we could remake it all by shortening each course. 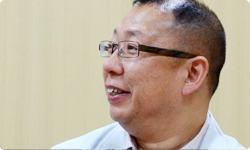 Takemoto-san, when Tezuka-san suggested changing it all, what did you think? Besides, when making New Super Mario Bros. U, we had tried to pack in as much as possible to use up all the ideas the staff had. So toward the end, when Tezuka-san said what he did, I thought, “Can we make another game?” And, to be honest, I was really uneasy. That’s exactly what the atmosphere was like! Yes. If I thought about it calmly, and I suspected they could make more. When development of New Super Mario Bros. 2 for Nintendo 3DS was over, some course developers had their hands free, so I brought them in. You brought in new blood. Exactly. Both games may have been in the New Super Mario Bros. series, but making a game for a handheld system and for a home console are two different things. I hoped that by bringing in a new team, we could make something new. I knew I was asking the absurd, but I told the staff to get started and see. What was it like to have that new input? A bunch of people raring to go joined in and chattered away as they began making more. Yes. Those who joined in later on made courses at a much faster pace, and I was worried about whether the original developers would be all right. But perhaps those who joined later stimulated them, because a lot of ideas started gradually coming up, so I think that Tezuka-san was right to bring in new blood. And, for example, when it comes to making courses, a Wii U team assumes multiplayer gameplay, so they tend toward wide courses. 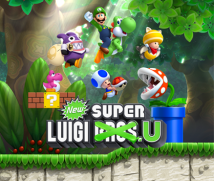 But the staff from Nintendo 3DS assumed single-player gameplay, so I think we were able to introduce a new feel to the New Super Mario Bros. U courses. And everyone worked so fast that I thought we would be done sooner than I expected. What about Luigi at that time? We were still making it with Mario. Luigi first made his debut 30 years ago in 1983, in the arcade game Mario Bros.6, and this year we’re releasing a number of games related to Luigi – such as Luigi’s Mansion 2 7. I asked Miyamoto-san what he thought about making this year The Year of Luigi, and he agreed, saying, “Drawing attention to Luigi, who’s always in the shadows, would be good,” and I said “I’ll wear a Luigi cap in Nintendo Direct8!” (laughs)6. Mario Bros.: An action game that first appeared in arcades in 1983. 7. Luigi’s Mansion 2: An action-adventure game released for the Nintendo 3DS system in March 2013.8. Nintendo Direct: Since 2013 marks 30 years since Luigi made his debut in the arcade version of Mario Bros. in 1983, Satoru Iwata appeared in the 14th February 2013 edition of Nintendo Direct wearing a Luigi hat to represent The Year of Luigi. I said, “Give me a piece of the action!” (laughs) I was actually really worried about the downloadable content. I wasn’t sure which direction to take. But I thought that switching the main character to Luigi instead of simply making the usual add-on content would attract lots of attention. And from our point of view, I thought building the game around Luigi would determine a direction, help us get focused into development, and make the game easier to make. So for me, The Year of Luigi was a real lifesaver! Miyamoto-san and I really heaped praise on your idea at that meeting.